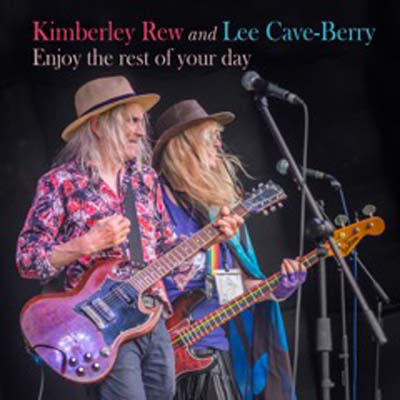 Kimberley Rew and Lee Cave-Berry are a songwriting, recording, singing, guitar and bass playing and gigging (usually plus a drummer) husband and wife team, from Cambridge, England. They have a considerable pedigree with local bands Jack, the Barefoot Doctors and the ever-rocking Wednesday Session. Rew’s history includes Robyn Hitchcock and the Soft Boys (whose album Underwater Moonlight will be found in the history books), Katrina and the Waves (whose Rew penned Walking on Sunshine will also be found in the history books) and the Eurovision Song Contest winning Love Shine a Light (these people have a lot of history books). To which Lee can add adventures with Fourth Labyrinth and Lexie Green. Though both have recorded band and solo albums before, 2019’s Enjoy the Rest of Your Day is the duo’s first collaborative collection of original material. It’s popshort on convenient stylistic labels such alternative, psychedelia, Power Pop, Glam, New Wave, Old Wave etc.., but abundant in universality, positivity, variety and across the board appeal to youngsters and oldsters of all ages, times and places, and general joy. And cats. Happy listening!